Artist Alice Ravenel Huger Smith was both enigmatic and straightforward. The famed Carolina Lowcountry painter (1876-1958) took classes at the Carolina Art Association in the 1890s but otherwise was largely self-taught. She disdained travel and few outside influences are evident in her work. She has been criticized in recent years for presenting images of an idealized antebellum South, featuring “happy ‘darkies’ and benevolent masters,” according to one modern historian. But she was also critical in helping raise the consciousness of indigenous Carolina Lowcountry culture and was at the forefront of the preservation movement in Charleston. While Smith is best known for 29 watercolors included in A Carolina Rice Plantation of the Fifties, she painted all sorts of pictures, from portraits early in her career to simple landscapes of long-leaf pine or swamp cypress. Beginning this week, a collection of more than four dozen of Smith’s works will be on display through next summer in Charleston, including watercolors, oil paintings on mahogany panels and several sketches. The artwork will be on display at both the Edmonston-Alston House and in the house museum at Middleton Place, both in Charleston. 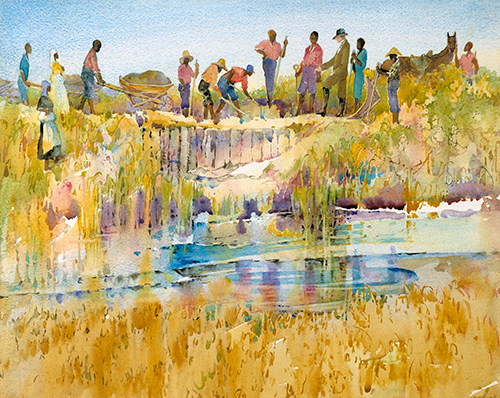 The rice plantation watercolors belong to the Gibbes Museum of Art; numerous other paintings are in private collections and rarely seen by the public, according to the Charleston Post and Courier. To be certain, Smith was a product of her times. The daughter of a former Confederate artilleryman, she sought to highlight the remembrances of the simpler pre-Civil War era that wealthy South Carolinians recalled in the decades after the war. Smith preferred to capture Lowcountry rural landscape to urban cityscapes of Charleston and enjoyed recording vanishing ways of life. Those included the scenes from rural salt marshes, areas which had once been used for tidal rice cultivation but had been abandoned as the rice economy moved west and the land had fallen into disuse, to be reclaimed by salt water. In addition, a small amount of rice was still being grown in the Lowcountry through the 1920s, giving Smith a glimpse of the industry that dated back to the late 17th century in South Carolina and had made many white planters wealthy and broken many enslaved blacks. She worked with her father, Daniel Elliott Huger Smith, a historian, on The Dwelling Houses of Charleston (1917), a biography of the Charleston miniaturist and portrait painter, Charles Fraser (1924), A Carolina Rice Plantation of the Fifties (1936), and A Charlestonian’s Recollections, 1846-1913 (1950), the last two completed after her father’s death in 1932. Smith’s works, like the artist herself, are unique and worth taking the time to visit. If one travels for any length of time, one is bound to experience an unhappy adventure or two. What turns a miserable traveling experience into one that can be looked back on with, if not fondness, than at least a smile is the ability to take something away from the experience, be it a lesson, a memory or the ability to count one’s blessings. George Woodcock (1912-1995) was a noted Canadian writer of political biography and history, an anarchist thinker and a literary critic. He also published several volumes of travel writing. As such, he experienced his share of “bad trips.” Among those that stood out was one he took in the early 1930s, during the Great Depression, while in his early 20s. One day, when I was visiting her, I decided to take a bus and visit the Rhondda area, the heart of the South Wales mining district. Rhondda has a special place in the thoughts of those with Welsh connections, for one of the finest of all Welsh songs – stunning when the daios from the valley sing it at a rugby match – is called ‘Cwm Rhondda’ the hill of Rhondda. 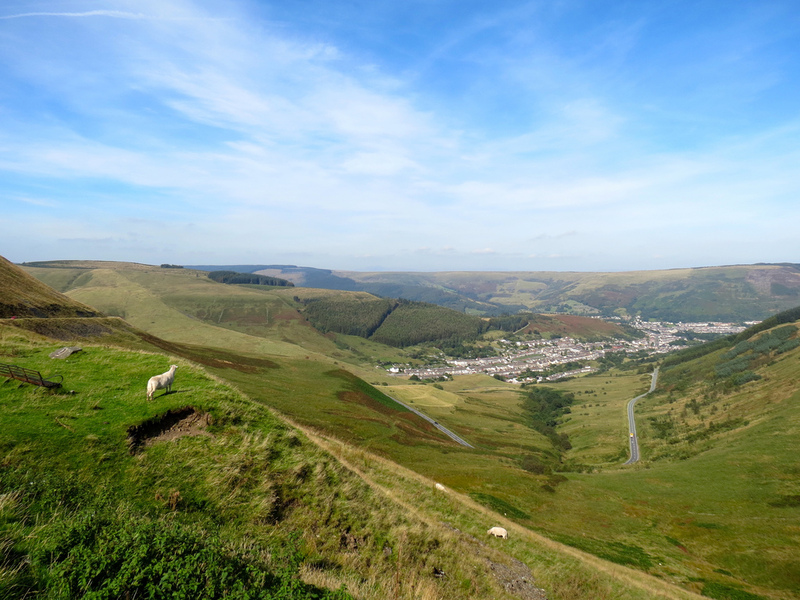 There are actually two valleys – Rhondda Mawr, Great Rhondda, or the main valley, and Rhondda Fach, the lesser valley of little Rhondda that branches off from it. I intended to go up Rhondda Mawr, cross over the intervening hills, and come down in Rhondda Fach, which I would descend and then make my way back to Bridgend, where I was staying. It was the worst of times in Rhondda, though it probably looked just a little better than the best of times, since most of the mines were not working, and the smoke that would normally have given a dark, satanic aspect to the landscape was less evident that in more prosperous days. Still, it was dismal enough: a long ribbon of a main road with no real gap in the houses, so that it seemed like a single serpentine town, thickening out at each village centre like knots on a string. The houses were mostly built of gray stone long turned black from soot. In the middle distance reared up the gaunt towers and immense wheels of the pitheads and the truncated pyramids of the slag heaps. There were a few sickly trees among the houses, but the hills on each side were bare and greenish brown; spring had hardly begun. It had the feeling of occupied territory. Many of the shops had gone out of business, the mines had slowed down years ago, and the General Strike of 1926 – disastrous for the workers – had delivered the coup de grace to the local economy. The people were shabby and resentful. Groups of ragged men squatted on their haunches, as miners do, and played pitch-and-toss with buttons; they had no halfpennies to venture. A man came strolling down the street, dejectedly whistling ‘The Red Flag’ in slow time as if it were a dirge. Later, after being caught on the hills in a drenching downpour, Woodcock soddenly came across a slag heap where approximately 50 men and women were industriously picking over the ground. I caught up with a man walking along the overgrown road from the mine into the village, whose damp slate roofs I could see glistening about half a mile away. He was pushing a rusty old bicycle that had no saddle and no tires, but it served to transport the dirty gunnysack he had tied onto the handle bars. He had been picking coat from the lagheap. ‘No bigger nor walnuts, man,’ he explained. The big coal had been taken years ago, so long ago it was since work had been seen in the village. I asked him how long he had been unemployed. ‘Ach y fi, man, it’s nine years I’ve been wasting and wasted.’ Yet he was friendly, perhaps because I looked such a wretched object that he saw me as an equal in misery. Teaching appears increasingly to be among those no-win careers. Given the limits placed on educators in terms of maintaining discipline, the disrespect shown instructors by students – and in some cases, parents – and the ever-increasing paperwork involved with being a teacher, it is not a job for the faint of heart. That said, teaching is not on par with peacekeeping duty in sub-Saharan Africa, a Sherpa employed as a guide on Mt. Everest or working the fields as a migrant laborer. Yes, teachers (and coaches) are put in a difficult position by administration and school boards who require them to ask parents for not insignificant fees. In my district, there are charges for students to play sports, participate in clubs, play in the band and even to park a car at school during class hours. There are course-specific fees, as well, varying from $5 up to $100, with most being in the $20 to $50 range. While these are for the more specialize classes such as welding and culinary arts, they represent additional costs that can add up, particularly for large families. 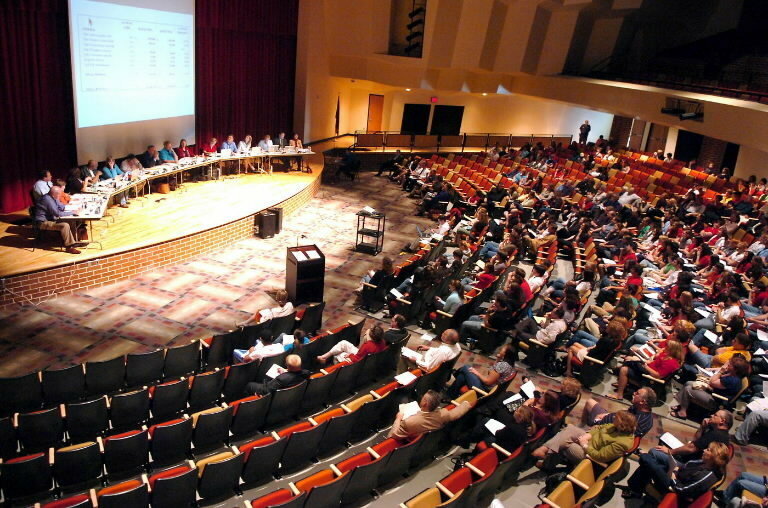 The disconnect seems to be in the area of district administrators, who are intent on creating fiefdoms, and teachers, who are left with less than enough money to run their classrooms with the resources they need. But when I receive an email from one of my daughters’ schools titled “Save Our Teachers,” requesting donations for the purchase of such items of chocolate, bottled water, Coke and snacks for “teachers’ monthly faculty meetings,” it seems a bit much. For what parents have to pay in fees, cover in costs for student fundraisers, not to mention pay out in taxes for a school system that seems stronger on style than substance given the majesty of many of its buildings and athletic complexes, it’s just a bit off-putting. Nearly everyone working today has monthly or, as in some cases, weekly meetings. It’s part of the job. Most of us wouldn’t imagine sending out an email to our employer’s membership list or vendors requesting donations for chocolate, snacks and bottled water during our own meetings. We’d likely get fired if we did so. The district my students attend is one of the wealthiest in the state, if not the wealthiest – though I doubt I’m doing my part in that area – and most of the teachers are well compensated. That said, I understand that teaching is a demanding job that often extends well beyond the hours a school is open. 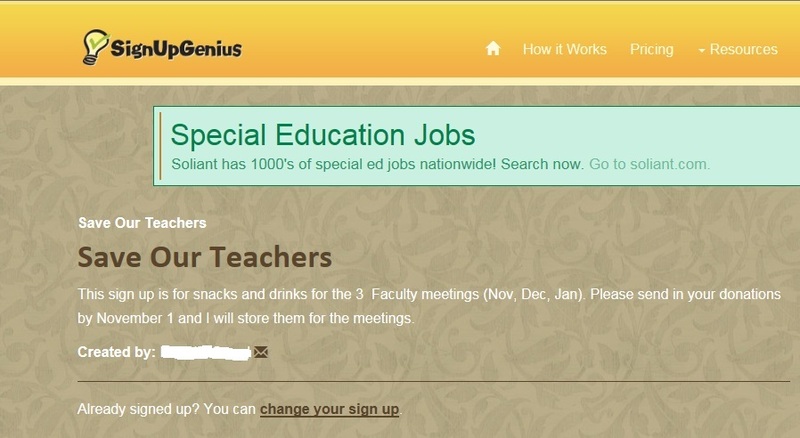 But sending out a plea for money so teachers can be plied with for snacks and drinks during their once-a-month meetings seems a tone-deaf move, at best. 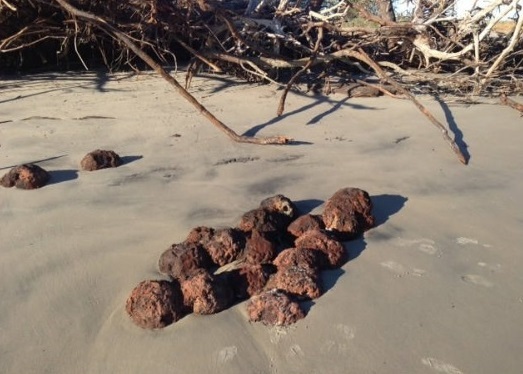 When word circulated that Civil War-era cannon balls had been uncovered on beach south of Charleston following last weekend’s hurricane, I was somewhat surprised. While the strength of such storms can’t be underestimated, the ability to move, say, a 12- or 24-pound round shell from the bottom of Charleston Harbor onto a beach would be quite a feat. It appears that the clutch of 16 cannon balls found Sunday on Folly Beach had most likely been in place since the 1861-65 conflict. “There was a gun emplacement there during the Civil War and this must have been a stack because they were all consolidated together,” John Manzi, who has a home on Little Oak Island, on the other side of Folly, told USA Today. Manzi said a friend went on to the beach Sunday and found the Civil War-era shells. Bomb squads successfully detonated most of the shells, which were badly corroded by 150 years of sand and salt. An official with the area sheriff’s department said a few of the shells were transported to the nearby Navy base. Maj. Eric Watson, a public information officer with the Charleston County Sheriff’s Office, said his office had to wait for the tide to go down to recover all the ordnance. “When the tide receded, our guys and members of the US Air Force explosive team used a small amount of C-4 to detonate the cannon balls right there on the beach,” he said. Fuse holes were noted in at least some of the shells, indicating the ordnance was designed to explode, rather than being solid shot, which was used to batter targets. Savannah’s Methuselah, sloppy mind or stonecutter’s mistake? Claims to amazing longevity are not only legion, they go back thousands of years. Methuselah is noted in the bible for having lived 969 years; Jimmu, alleged to be the first emperor of Japan, was said to have survived more than 125 years; and the Soviet Union claimed that as of 1960 it had 100 citizens between the ages of 120 and 156. Science, though, recognizes France’s Jeanne Calment (1875–1997), who lived to the age of 122 years and 164 days, as the longest-lived person, at least that can be verified. She lived three years longer than the runner-up, Sarah Knauss of the US, who died in 1999 at 119. Were the information on Dunphey’s gravestone correct, it would mean he had been born in 1689, the year before the Battle of the Boyne, fought between English King James II and the Dutch Prince William of Orange. William and his wife Mary had overthrown James in 1688. The battle, fought near the town of Drogheda on the east coast of Ireland, about 100 miles from Clonmel, resulted in a victory for William, curtailed James’s bid to retaken the English throne and aided in ensuring the continued Protestant ascendancy in Ireland. It is still a point of pride today with Protestants in Northern Ireland, the more low brow of whom use it as occasion to attempt to whip up anti-Catholic feeling. 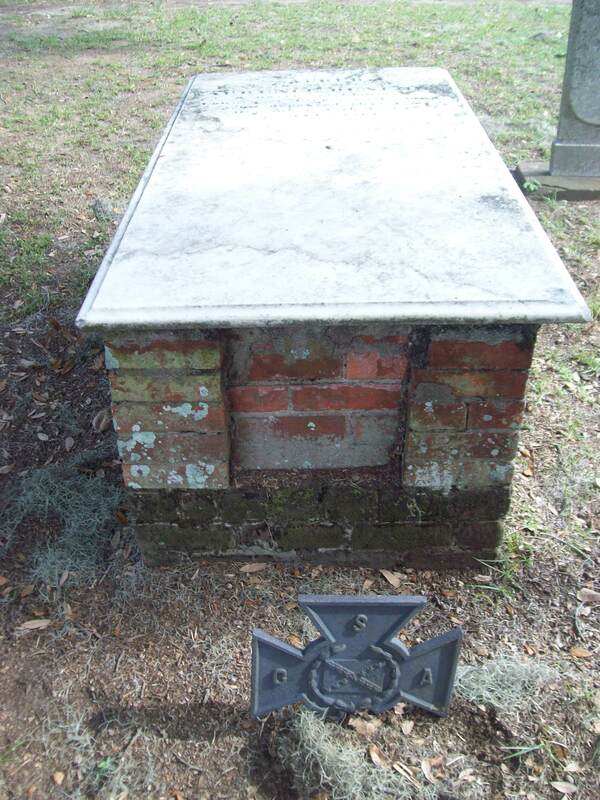 Box vault of Laurence Dunphey in Catholic Cemetery, Savannah, Ga. Note Southern Cross of Honor in front of grave, apparently depicting belief that Dunphey, who died in 1834 at the purported age of 145, also managed to fight in the US Civil War (1861-65). Georgia itself wasn’t established as a British colony until 1733, when Dunphey would purportedly have been 44 years old. Of course, it’s almost a certainty that Dunphey was not 145 when he died in 1834. It’s possible Dunphey was old, even very old when he died, but it’s more likely that a mistake was made by someone somewhere along the line. While some Irish immigrants had moved into Georgia from South Carolina in the 18th century and there were Irish who came with founder James Oglethorpe when he arrived in Savannah in 1733, the first wave of Irish immigration directly into Savannah came in the 1830s, with the arrival of individuals to help build the Central Rail Road and Canal Co., later the Central of Georgia Railway. Had Dunphey immigrated with the very earliest settlers to Georgia, he probably would have been recognized as such as his death; it seems implausible that he chose to leave his homeland and come over with the first major wave of Irish immigrants at the age of 140-plus. A writer for the Catholic Diocese of Savannah speculated that Dunphey’s age was probably inscribed on his gravestone by “bored Union soldiers” during or just after the War Between the States. However, the lettering appears identical across the marker, meaning that unless the Federal soldier-turned-mischievous stonemason opted to remake an entire marble slab, it’s almost certain that the grave marker was made shortly after Dunphey’s death. There is also the possibility that the stonemason working on Dunphey’s marker simply made a mistake, carving “145” instead of, say, “45.” And given that there’s no “reset” button when you’re working with stone, you get what you get. 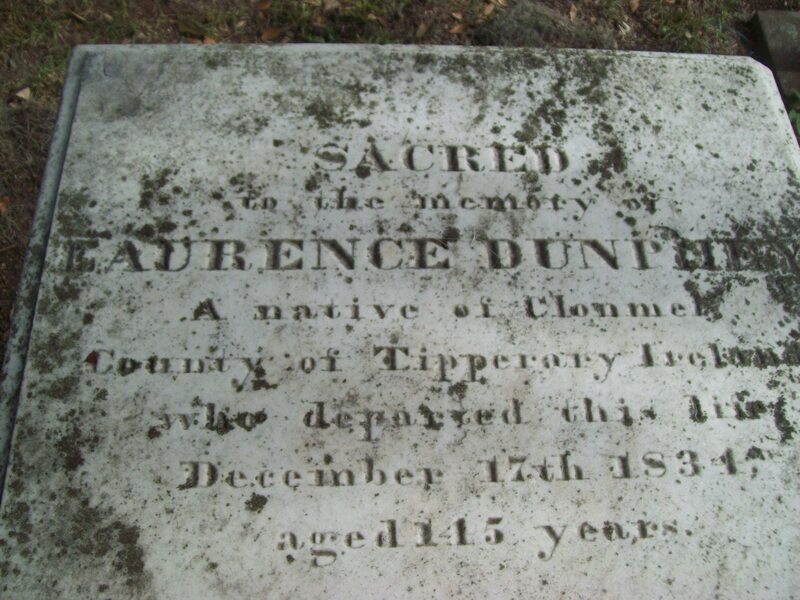 Whatever the real story behind the age of Laurence Dunphey – County Tipperary native, US immigrant and long-dead Irish Catholic – he’s managed to achieve a small bit of immortality, no matter how long he really lived.